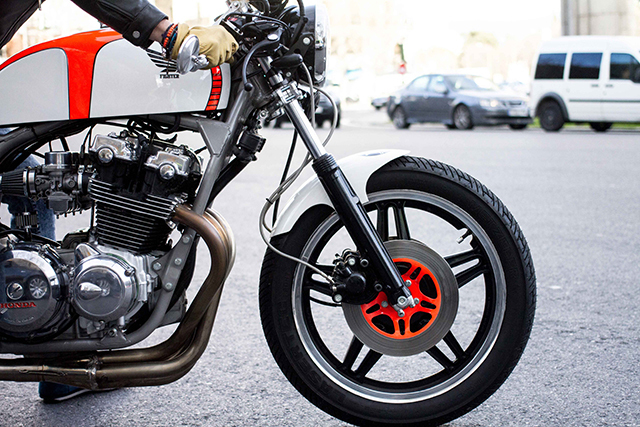 From the time the Café Racer scene had its second coming, the Honda CB750 of the 70’s and 80’s has been one of the bikes of choice for high end builders and backyarders alike. But far too often over looked is its thunderous big brother, with race pedigree and freight train pulling power the CB900 makes a fantastic base for a Café Racer with some extra muscle! 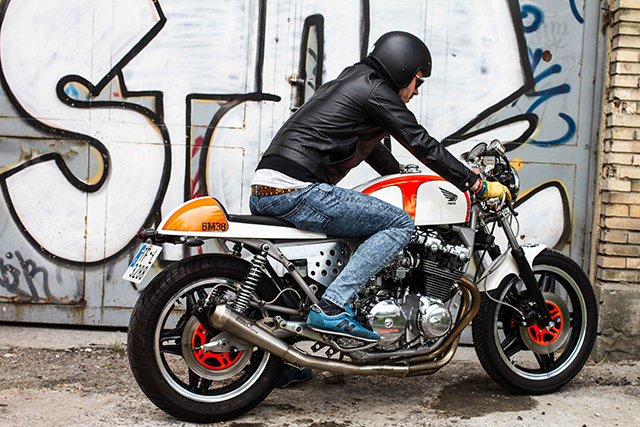 Born just a year ago in Madrid Spain, Nitro Cycles, is a new family run workshop with a passion for the motorcycles of a generation ago and breathing life into bikes that have been long since left to rot. 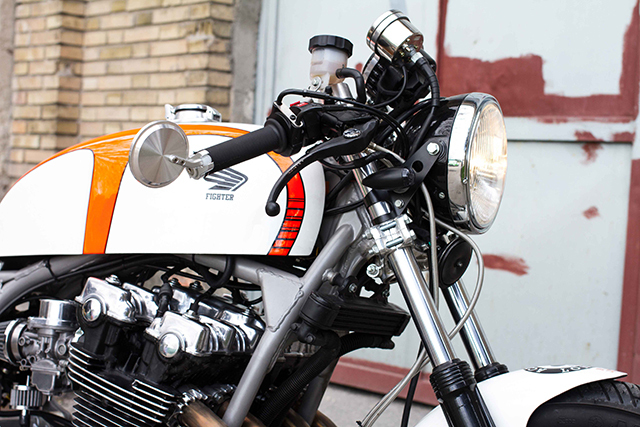 With a fairly wrecked CB900 sitting around it made sense to make it the first Nitro Cycles build and team, led by Antonio, got to work on making the most of what was left of the 1982 model. The CB was taken back to the bare frame, however even this super strong piece of steel was damaged. But the bike was being built in honour of Antonio’s Grandfather and nicknamed the “Fighter” there was no way they were giving up. So with hours of hard graft the twin down-tube steel frame was restored back to original condition before being treated to a new coat of silver paint. With a foundation to work from it was time to turn their attention to the locomotive like engine. By the time 1982 had rolled around the CB750 engine no longer provided anywhere near enough power to compete with the competition, but nearly 30bhp extra from the 901cc engine in the CB900 meant it had no such problem. With the engine built to factory specs the Nitro crew knew how much the big square bore Honda benefits from breathing mods and fabricated a beautiful set of 4-1 headers. 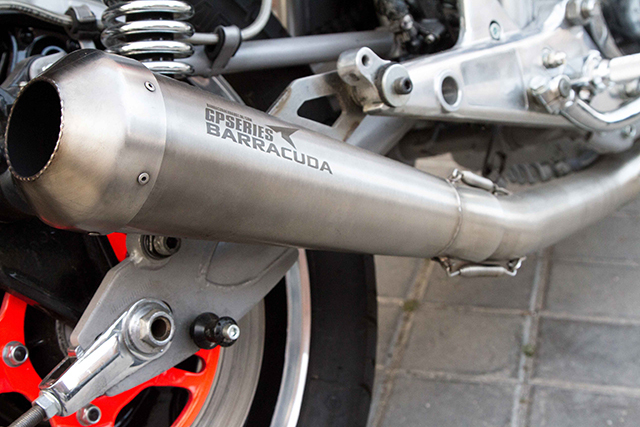 Finishing off the exhaust is a GP Series Barracuda muffler and having seen video of the bike, the rumble is truly impressive! K&N Filters allow the engine to breathe on the induction side with ease, while polished covers and carbs give the look to match the mumbo. Known as the Bol d’Or across the European market in honour of the famous endurance race, the CB900 takes much of its technology from Hondas race bikes of the time. Despite many assuming it to be a heavy motorcycle it only tips the scales a few kilos heavier than the CB750 and the race developed anti-dive front fork system gives extra confidence both when hard on the anchors and provide tremendous feedback as you tip into a turn. While the rear end is propped up with a pair of chrome shocks from the guys at Hagon. The twin disc front remains standard as does the whopping rear single but the Nitro Honda benefits from braided lines at both ends. The look of the bike will have most assuming it’s a CB750, gone is the big slab tank and in its place a much more retro looking custom tank that reduces much of the bulk. A custom café seat makes sure the big tailed factory item won’t see light of day and with the trimmed down fender the 900 suddenly appears much smaller than it actually is. 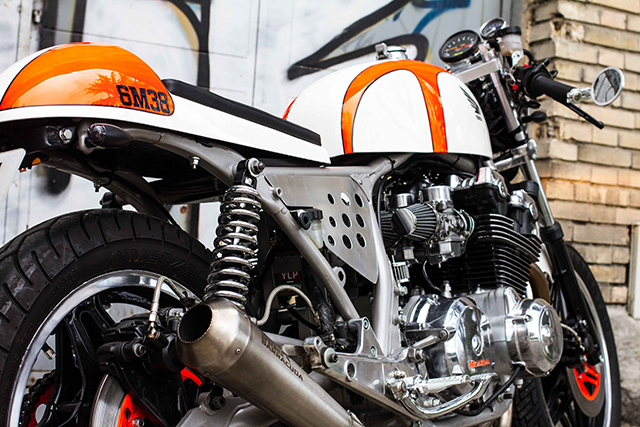 A chrome filler cap breaks up the stunning white and orange paint that has been lovingly flowed over the tins with “Fighter” replacing Honda on the tank. 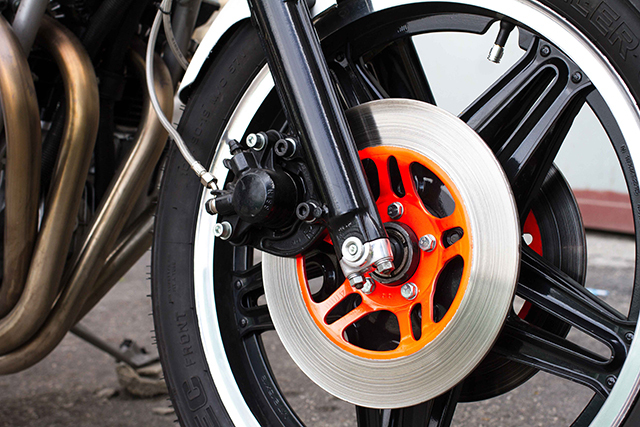 The orange has also been neatly applied to the inside of all brake rotors and the sprocket giving an amazing effect when the bike is underway. 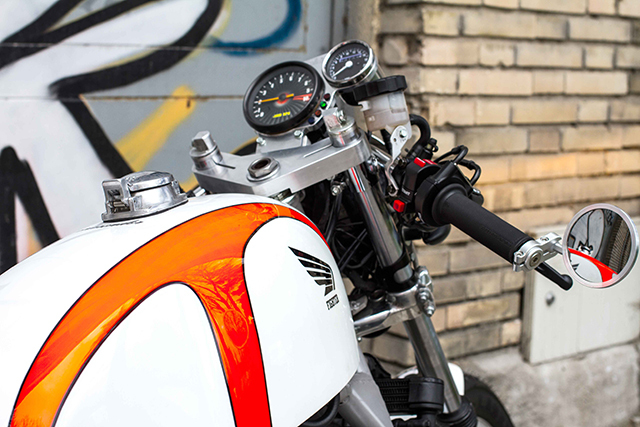 While custom side covers, bullet indicators and a retro brake light ensure that the slimmed down clean look is maintained across every inch of the build. 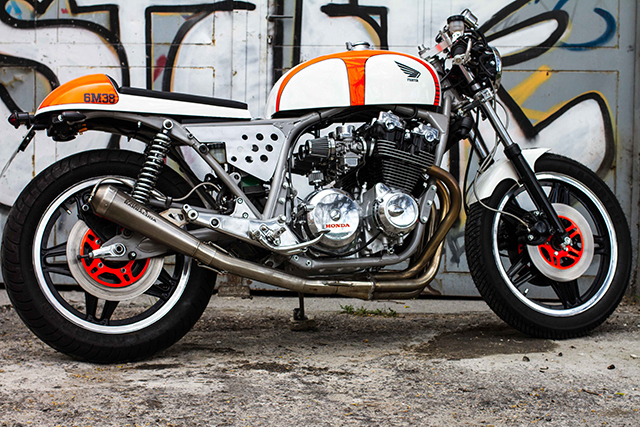 With the hard work complete Antonio and Nitro Cycles can be very proud of the muscle packed CB900 café racer that has put them on the map. And in one final touch that shows the soul of both bike and build, the rear section sports the date 6th May, a birthday Antonio shared with his Grandfather. He was the man who inspired the build, who had Gasoline running through his veins and was a true “Fighter” to the very end, Descanse En Paz!